Posted on October 10, 2012, in PUBLIC RELATIONS - Advice, Encouragement and Community and tagged advice, belief, confidence, courage, encouragement, mother, motherhood, parenting, self-help, stay-at-home mom. Bookmark the permalink. 1 Comment. I love what you wrote. 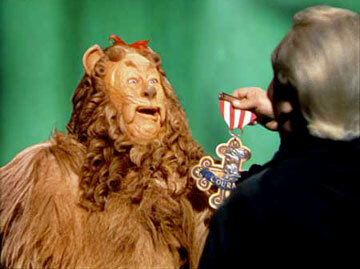 The Lion in the Wizard of Oz is the king of the forest. After facing his fears he found out he had a courageous heart. Thank you for bestowing a medal of courage on your readers.